It is the message, not the messenger! Today I was asked to describe my art in ten words or so. The painting shared today is named “Three is Not Company”. What I like to do is make you think about what I have painted and realize there is more than goes into a painting than you might think. It was the day, it was Paris, is amazing how uncomfortable the woman on the right looked as the man in the middle was intensely interested in the woman on the left. What do you think, is it a good description of my art? As flowers wake up on a cold rainy morning maybe they cry looking for the sunshine. They are probably tears of joy that they get to bring like into someone’s heart for another day. Looking at the tulips in my yard, I know they have such a short life=span and I so enjoy them while they are blooming. Wish someone would invent/design or hybrid a Tulip that blooms longer. Wish More People Did? Do you ever feel that way. I have a hard time walking by a beautiful garden, bouquet or florist stand without smiling. Often when I am out walking I will smile and say hello to people and to some it is like an intrusion on their space and I wonder if they have the power of smile anywhere? 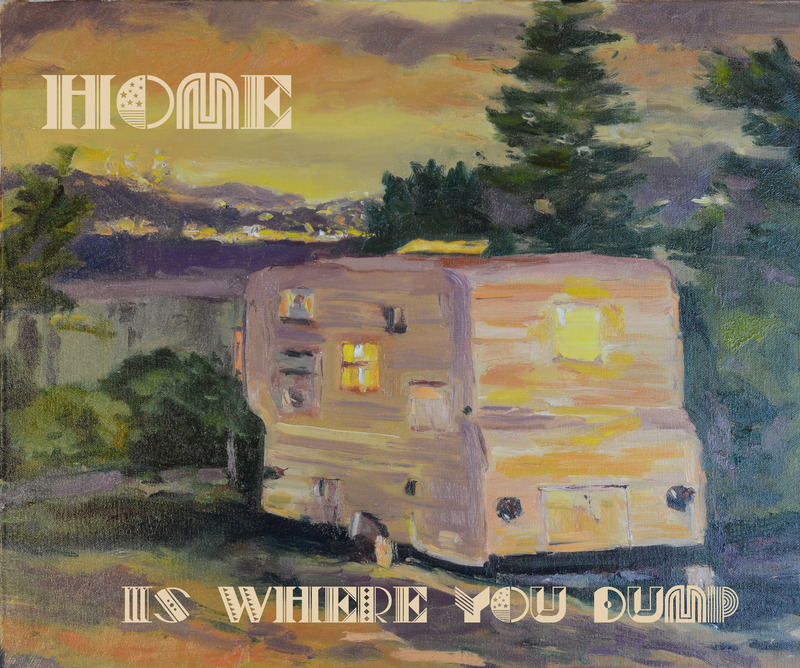 Home is where you ??? As most of you know I have been using my paintings to make smaller plaques and with this one I have dilemma. Which saying to use? One is a little crass and the other coupld mean a couple of different things? The Dream: This leafy mofo is an Airstream interpretation of Henri Rousseau’s 1910 painting “The Dream”; which, for you, still might be to visit Daliwood, a land where clocks melt off walls and swans reflect on elephants. Love the adaption to an Airstream! The last few days it has been nice enough to work in my garden, one of the other things I love. The other day my friend Derek Gundy asked the question on his Facebook page, what is your most productive time of day! I used to be a “Morning Person”, as I have gotten older I feel the need to take my long walk when I first get up, after doing my blog, my Facebook and my Email. Maybe I was more of a a “Morning” person, when you did not have to do so many things before you could start your real day. We all have or hope to have Best friends in our lives. We should cherish those few that are so special to us. My two best friends I have known for over 30 years. They are my constant, my back and we are always there for each other. I wonder some days if we paint our mood or write our mood of the day. I have noticed in my abstract paintings you can tell if I am happier or not. Working on coming up with quotes for my work, I do notice that drawings you are drawn to evoke feelings you have at the time. My emotion shows up in the topics I pick or the colors I use. How about you?